Fireworks set to start at 9:20 p.m. Wherever you go to watch the Macy's fireworks, make sure you get there early. Real early. New Yorkers have an open invitation to celebrate Independence Day along the Hudson River with what is billed as the nation's largest fireworks show tonight. But you'd better claim your spot long before the first shell is shot into the evening sky at about 9:20 p.m. If you have any New Jersey friends with views, this would be the weekend to pay them a visit. Just don't show up empty-handed. In honor of the 400th anniversary of Henry Hudson's historic voyage up the river separating Manhattan from Jersey -- weren't you just talking about that the other day? -- Macy's has themed this year's pyrotechnic extravaganza "American River." More than 40,000 shells will fire from six barges lined end-to-end in the Hudson, spanning 24th street to 50th street. The 33rd annual event is expected to be the longest continuous show in the event's history. Tonight's Macy's-sponsored show is moving back to the Hudson River, instead of the East River, for the first time since the Sept. 11 terrorist attacks. The move provides prime vantage points for Manhattan's West Side and parts of New Jersey, but some East Side business owners aren't happy. Organizers say this year's show uses bigger shells that fly higher -- as high as 1,000 feet -- so more people can see the colorful display. 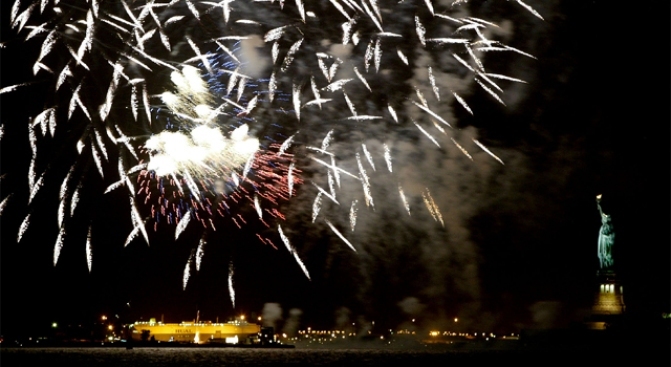 It involves more than 22 tons of fireworks, launched from six barges spread over 25 city blocks. The display is set to start at 9:20 p.m.
+ At 7:20 p.m., two FDNY Marine fire boats will put on a spectacular water show. + At 8 p.m., jets from the Air National Guard's 104th Fighter Wing will impress the hundreds of thousands below with a special flyover in tribute to the holiday. To witness all the pageantry, spectators on the Manhattan side can get situated along 11th Avenue. The views get better the farther below 59th Street you go. The best seats in the house are at Pier 54 at 14th Street and Pier 84 at 44th Street, but beware -- access is limited. And if you're dead-set on the Manhattan backdrop, Jersey City, Hoboken, Weehawken and North Bergen are your best bets in New Jersey.